It is a metabolic disease ie primarily a disruption to the endocrine system via the pituitary gland. It is known as Pituitary Pars Intermedia Dysfunction or PPID. Cushing’s (PPID) is caused by progressive nerve degeneration within the hypothalamus, leading to a reduction in a neurotrasmitter substance called dopamine. Dopamine is important in controlling the secretions of a part of the pituitary gland which in turn is responsible for controlling the secretion of hormones including ACTH and cortisol. When the pituitary is not exposed to enough dopamine from the hypothalamus, the production of these hormones (ACTH) becomes abnormally high . ACTH refers to Adrenocorticotropic hormone is produced in the, pituitary gland in the brain. 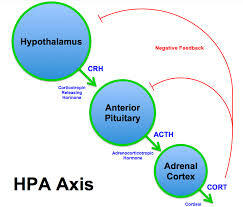 The function of ACTH is to regulate levels of the steroid hormone cortisol, which released from the adrenal gland. Too much and sustained will cortisol/stress will lead to cushings. This diagram shows the stress pathway. With this in mind it is very important that you manage your pet’s stress levels. Blood tests will reveal abnormally high levels of ACTH Adrenocorticotropic hormone. Low levels of dopamine which leads to lethargy and poor movement. Decreased muscle integrity due to low levels of dopamine and a lack of movement which leads to a change in attitude/lethargy. Fat deposits, especially along the neck and abdomen. Bruises easily with lumps under the skin. 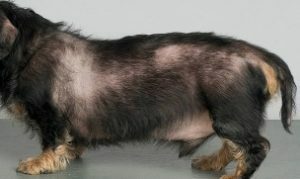 Age ; generally older pets are more prone to this disease this is because as a pet ages the cortisol set point remains and becomes progressively higher which ultimately will impact on the hypothalamus. Prolonged stress. This is not to be confused with neglect and cruelty though this would certainly contribute to its onset. I refer to more subtle form of stress from systemic inflammation, a predominantly hyper alert state, a pet that is exposed to situations that stress them and don’t respond well to desensitising training methods. Untreated or poorly managed insulin resistance and/or sub-clinical diabetes. Diet too high in simple sugars, transfats, wheat based foods, processed feeds ie a diet consisting solely of biscuits, low vitamin D levels. Initial diagnosis include measuring the resting ACTH level, performing a TRH Stimulation Test, and others and from that prescribing the following not to be confused with normal aging. Cortisol levels (hyperadrenocorticism) can be measure but because concentrations of cortisol fluctuate throughout the day,this can not be used in isolation. Additional tests include : ACTH Stimulation Test, Low-Dose Dexamethasone Suppression Test, and Urinary Cortisol:Creatinine Ratio. Dietary changes: reduce all processed foods in particular those that have wheat and omega oils added at the time of manufacture. Address possible insulin resistance by eliminating completely sweet treats and refined wheat products. Lower the food GI by adding coconut oil. Add between 1-2 tsp of coconut oil to food as this will help lower GI and reduce the insulin fluctuations. Coconut oil (MCT’s) are broken down immediately by saliva and gastric juice enzymes so that the pancreatic fat-digesting juices are not involved in their digestion. They are then broken down into medium chain fatty acids (MCFAs). Unlike other fatty acids these MCFA’s are absorbed directly from the intestines into the portal vein the then straight onto the liver. They are not packaged into lipoproteins like other fatty acids( tending to lay down fat) but are converted into fuel via the liver. This also helps help stabilize blood sugar. Manage Stress levels this is essential in reducing the adrenal reactivity and elevated cortisol levels. Make sure that your pet is exercised daily. St John’s wort is NOT recommended for this condition, as it will raise already over elevated serotonin levels. Ashwagandha Withania somnifera is an adaptogen which is able to bring the endocrine system into balance as well as an is anti-inflammatory agent, and as an “adaptogen” (endurance enhancer) and able to reduce the effect of stress. Of note is that is also able to increase levels of available dopamine. (Something that is low in animals with Cushings. Its exact physiological effect can be found by following this link.